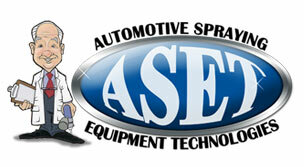 The week after SEMA, Nov. 9th-12th: ASET, the number one distributor of Anest Iwata products in North America, put on an Open House/Kustom Paint workshop at their state of the art training facility in SLC, Utah. Not just your average open house, they boasted a Hands-On Kustom Paint Workshop that would rival any currently in the industry. The event started on Wed with the official open house showing off the training facility, and top of the line $250,000 spray booth system. The artists started working on their respective display pieces during the open house, as guests were given a tour of the facilities, and fed catered gourmet appetizers, with an open bar throughout the nite. 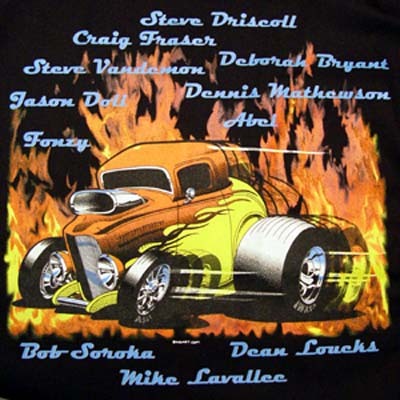 The kustom painters in attendance that gave both paint demos, and hands-on clinics were as follows: Steve Vandemon, Steve Driscoll, Deborah Mahann, Bob Soroka, Dennnis Mathewson, Ryan Templeton, Dean Loucks, Jason Doll, and your's truly Craig Fraser. The three newest artists to attend, and give demos, were Abel, Fonzy, and Mike Lavalee. This event continuts to attract new talent, and next years list is already filling up. Some of the manufacturers in attendance that sponsored the event, demonstrated, and sold new products were: Medea/Iwata, Artool, Alsacorp, Dupont Hot Hues, and Anest Iwata. With 11 artist instructing, and over 60 students in attendance for the three day workshop series, it out did the previous years show, and is definitely a landmark event in kustom painting.. Check out the pics below, and keep a space on your calendar for next year to attend. A number of this years attendees have already reserved their space, and since this year sold out well over a month before the show, you should start making plans now. See you there next time! "Paint to live, live to paint"! "Here are the pics of the guest artists, and their display pieces that were worked on during the actual event"
"Below are the pics of the Open House, and the Workshops"
"Click Below To Check Out The Pics From 2004"